I love masquerade gowns, and your gowns are some of the best! I loved last year’s sisters story, but even if this week doesn’t have a plot to it I’d be happy. Thank you! I love the amount of detail you put into it and I love the scales! The border kind of has a jeweled look and makes me think the dragon is carrying it’s horde around with it. Oh my gosh I can see why! That is amazing though. Its so beautiful! Woah! I audibly gasped! This is amazing! What a wonderful gown it is! It looks like a dragon. Liana, you are a true artist. I. Love. It! I gasped when I saw it!! Fantastic! Incredible! Amazing! Wonderful! Gorgous! I could just imagine the “wall flower” showing up in this gown and leaving every single tongue wagger completely silenced. This is the dress that could wield that much power. And her life was changed from that time forward. Wow! You have outdone yourself – this is gorgeous! HOW FRIGG’N AWESOME!!!!!!!!! ILY!! !- WELL IT TOOO! :) omg! i cant believe this is da first of the series!!! how do you thing your gonna top it??!! I CANT WAIT!!! Lovely work. There’s a whimsy to this dress I really like. It feels playful, as much as a dragon can be playful. How do you even think of these things, much less be able to draw them? Absolutely magnificent! Amazing! Our posts are eerily similar… as are our late reasons… although my gown isn’t nearly as spectacular! It is really dragonlike! I wish I could draw like that! So many details! WOW! Wow! Ashita recently drew a dragon themed one too! This dress is absolutely amazing! The design, detail, and colors! I am in awe of your talent! What if you did an Anne in Green Gables one? Or mayhaps an Arwen dress from LOTR? 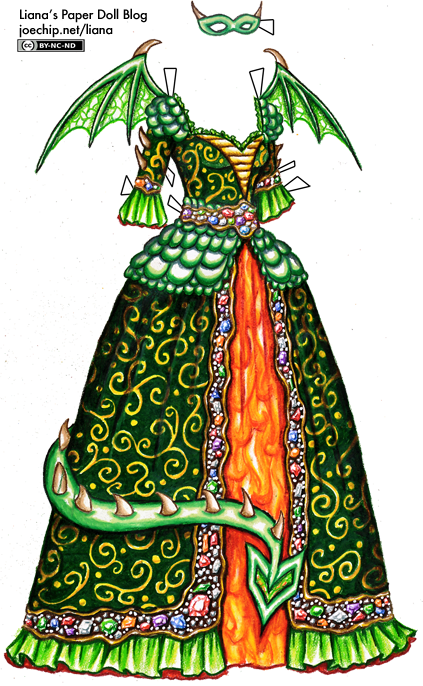 I love how there is a slight mischeiviosness to this dress, how that tail curls around the side and the mask has points at the edge. The patterns remind me of storys like repunzel and “fairytales” where a dragon guards a princess or a hourd of treasure. This dress is so awesome! I love the intricacy of it and the details and color! Its so beautiful and you inspire me! This dress is so intricate. Once again you are amazing. I really like the flame underskirt peeking out and the gold detail is really well done. I think maybe we should just crown you Queen of Blog Posted Paper Dolls and call it a day. What’s the name of your blog Alexandra? I’d love to visit it! And ashita apparently drew a similar dress. What’s her blog? I love paper dolls so If any of you have blog please post me the links! Thank-you so much! Hope you like it, I like to use your work when I’m making a picture, and I want to dress the girl up! Send me an e-mail if you don’t want me to use your work! Firstly, I love the dress, as always. The detail in it is amazing. :) You’re probably busy, as no dresses have been posted recently, plus I doubt you take requests like this and at such short notice, but it’s my birthday tomorrow and I would absolutely LOVE it if you drew a dress. I don’t even care what it is, Halloween is my favorite holiday and I like your witchy/fantasy stuff. So, just a far-fetched request, if you’re in the mood. where’s all the rest of the halloween outfits???? hmmmmm???? Wow, Kenzie, really? This blog is something that Liana does out of love of drawing and fancy clothes, not something she does because she has to. If something comes up in her life this has to take a back-seat, or possibly even be thrown in the trunk. Yes, I am disappointed that there are no new dresses. I love Liana’s past Halloween dresses, and the start of this October’s was fantastic. But this absence of new dresses where she seemed so eager to draw awesome fantasy dresses is more concerning than anything. Hopefully nothing awful has happened, and this dry spell can be attributed to the power of the dragon using up all her creative juices. I’m sorry to worry you! It’s mostly that I’ve been getting busy with work and not feeling creative at all. I have a little more time this week, so I hope to get some more drawing done. We are lucky that you post your work here and have no right to demand new ones. The fact that you take time out of your day to draw us dresses should be enough. Kenzie, I understand that you may be eager to see new posts but unless you draw us dresses half and gorgeous as liana’s every day I would just wait quietly and patiently. Thank you so much for the website Diane. I am also annoyed! October is my favorite month and it’s slipping away! At least I can enjoy this gown each time I check and recheck for an update. Best dress I’ve ever laid eyes on.